I just finished reading this interview with Xia(h) Junsu and honestly, everybody who has ever been interested in a) the idolverse, b) the concept of “image” or c) questioning gender should read it. Which hopefully means everybody who has ever visited this blog. This man may have an image quite far from the brooding type, but he obviously has a lot going on in his head, and I am so happy that he is able to express it better these days. Read it! With both Lars and me away on the countryside to spend time with our families, it would probably be more depressing if we did keep up with what goes on in the kpopverse. Still, I can’t help but keep an eye on the promotions for a kdrama I’m really looking forward to, namely To the Beautiful You, the kdrama adaptation of classic manga (and later jdrama) Hana-Kimi. There are several reasons for my enthusiasm. To begin with, Sulli is in it! 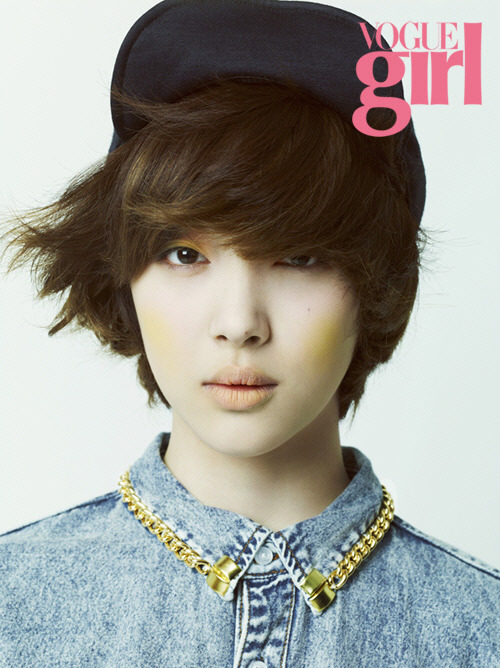 I often feel somewhat alone in having such a soft spot for Sulli, especially among other female f(x) fans. Mostly I guess it’s because her image has made her come out as a cute, childish, and frankly not quite that smart girl without a clear place in f(x). Luckily for me, I thought she was hot-to-be (like, too young to be hot but seemingly growing up to be attractive in my eyes) enough to keep a closer track on anyway. Because of that, I kind of looked out for what she did and said during promotions and started to believe that underneath that cutesy image was someone with a potential to grow up to quite interesting a person. In this recent interview on her role as Goo Jaehee, she confirmed that by putting in words some suspicions I’ve held for a while, like this: “Most people think of me as a child with a lot of cuteness, but truthfully I’m a bit gruff and I have somewhat of a masculine side. I also tend not to express myself. It’s been difficult to bring out that part of me in f(x), so I think it worked out well that I can naturally show something close to my real image through this role.” As if that wouldn’t make me interested. Also, I guess I might be starting to see Sulli as an adult, which is about time considering she’s 18, the age of majority in Sweden. Still feel a bit weird over how attractive I find her in recent pictures. Maybe it’s just the alternative lifestyle haircut (I like long hair, but a short cut can sometimes be a short-cut for determining whether or not a girl is into girls or not, which has Pavloved me into reacting to it). I am – surprise, surprise! – intensely interested in crossdressing stories in general, both when it’s done intentionally subversive and when it has a broader target audience, and I really loved Hana Kimi especially. I just hope Sulli and the drama’s director don’t make the lead less cool and more clumsy than the original – a stupid female lead is something I always fear when it comes to romcom-kdramas. Fingers crossed. I don’t have any hopes for Minho, though. Not that I hate him or anything, but he is my least favorite member of SHINee, and he will be taking on one of the most annoying male main characters I’ve ever seen in a drama. In Hana Kimi, I’m not sure if I would have been able to stand it had he not been portrayed by Oguri Shun, whom I like. But with my expectations this low, I guess it can only go upwards from here. You are currently viewing the archives for July, 2012 at The Future is Idol.